Medical grade HEPA, carbon, and negative air filter systems for critical particle control, medical infection control units, TB, H1N1 virus isolation rooms, hospitals, cleanrooms, construction renovation, and personal use. High performance air purifiers for allergies, asthma, VOCs, MCS and ODORS. Oxygen generators for ozone systems, oxygen bars and industrial uses. Ozone Generators for remediation; fire, flood, ODOR, MOLD, protein decomposition, VOC, virus, and bacterial sterilization. IQAir HealthPro Plus Featured on Extreme Makeover Home Edition. Passes EN 1822 Certification! The IQAir HealthPro Plus is the most popular HEPA Carbon Allergy Air Purifier we Sell! HealthPro Compact for allergy Sufferers. Maximum filtration of airborne particles, dust, allergens. IQAir GCX Series Air Purifiers. Filtration of microorganisms for infection control units, TB isolation rooms, critical particle control, cleanroom use to Class 100. IQAir Cleanroom Series H13 Air Purifiers for gas phase removal; residential, commercial environments. Remove VOC's, tobacco smoke, gaseous contaminants, chemicals. Free Shipping on all IQAir HEPA Air Purifier, Filter, and Carbon systems! Conservatively Rated Ozone Generators designed for professional remediators. Remove All odors & Smoke, Kill Mold, Sterilize Surfaces, Fire & Flood Restoration Products; see the new Ultra-High powered UV PRO 6800 designed for serious commercial applications. Click Here to Read more about ozone, applications and what ozone is used for. 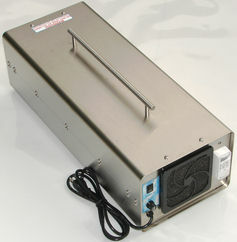 www.o3ozone.com carries both corona discharge and UV ultraviolet ozone generators. With ambient air systems, UV ozone generation is superior because of stable high outputs and reduced cleaning/ maintenance. SEE Compare uv ozone generator to corona discharge ozone generators. UV Ozone Generators: UV PRO 550, UV PRO 2800, UV PRO 4000, and the Ultra-High powered UV PRO 6800, fully adjustable HVAC UV 560 Duct mounted ozone generator air purifier. See the Ozone Safety page. It is recommended to use UV ozone generators over corona discharge ozone generators for all air and surface sterilization applications including MOLD treatment, Fire, Smoke, Flood, Water, ODOR, and Germ, Virus Remediation. UV ozone generators will last longer and require minimal cleaning and maintenance while maintaining consistent ozone output. The ozone output from all ambient air Corona Discharge Ozone Generators is significantly diminished by humidity and deposits (from the corona process). Guaranteed Lowest Prices! on Ozone and AirSep Oxygen o2 or o3 Generators. Guaranteed Lowest Prices! on all IQAIR / Austin Air / AllerAir HEPA Air Purifiers / Filters. o3ozone offers the industry's highest quality ozone generators with a 6-year warranty! Now offering Abatement Technologies HEPA Air Scrubbers for Mold Remediation, Construction, Hospitals! Ozone Shock Treatments Kill Mold, Germs & Odors Permanently. Ozone is 3187 times more effective than chlorine as a germicide! Ozone is a powerful oxidizer for commercial air, & water treatment. Ozone is used in Environmental Remediation and the Food Packaging Industry. OZONE Removes SMOKE, ODORS, Kills Virus, Bacteria, MOLD Contaminants. Used by professionals for protein decomposition (death scene cleanup) ODOR! Cigarette SMOKE, Basement MOLD, Auto, PET, SKUNK ODORS! Top name brand air purifiers use small amounts of ozone to purify air. Most that have used the ionic breeze type purifiers (approx. 10-15mghr ozone output) understand the limited ability of ionic breeze air purifiers at reducing strong odors. o3ozone ozone generators can sterilize surfaces and purify air with shock treatments; eliminate odor sources with oxidation. Our Smallest Ozone Generator, the DC PRO 450, puts out up to 450mghr of ozone (adjustable between 10 and 450mghr). To KILL MOLD, sterilize surfaces, it is necessary to choose the correct sized ozone generator. See our Selection Page to view approx. coverage ability of each ozone generator. Ozone generators are rated for 3 levels of ability; air purification use, mild shock treatment, and commercial shock treatment. Ozone Generators are known by the professional fire, flood restoration industry, crime scene / death scene clean up industry as highly effective tools to safely, permanently remove fire, mold, smoke damage, biological odors dead animal odors and more. See References page to view an endorsement by AMDECON, Inc. Training Center, a crime scene / death scene clean up / bio-recovery training center. 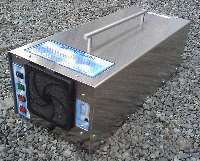 o3ozone.com carries both corona discharge and UV ultraviolet ozone generators. With ambient air systems, UV ozone generation is superior because of stable high outputs and reduced cleaning/ maintenance. UV Ozone Generators: UV PRO 550, UV PRO 2800, and UV PRO 4000.
, commercial, industrial equipment ozone generators with built in air driers. Accurate quick response technology makes this ozone monitor ideal for fire, flood restoration. Do aggressive competitor statements have you concerned about anything regarding ozone generators? Read our Informed Decision page for answers and resolution of many issues. All ozone generators, water, air purification, laboratory equipment products are built in North America! Compare the most popular IQAir HEPA and Gas Filter models. Looking for other IQAir® Models? All IQAir® models available! Call or email info@o3ozone.com for info or to purchase any IQAir® purifier. See IQAir's® List of expanded and detailed list of pathogens. Ozone Generators for Shock Treatment Questions and Answers Select Ozone Generators. water purification, mold restoration, pet odor removal, disinfection, remove smoke. Austin Air and IQAir HEPA Gas ODOR air purifiers Guaranteed Lowest Price! 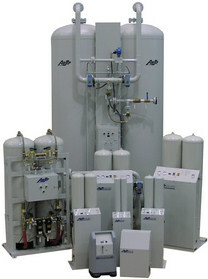 AirSep oxygen systems - oxygen bar therapy, Aquaculture, Veterinary Medicine, Glass Blowing, industrial uses. o3ozone - quality equipment for your application!